Being sick is a bummer. Whether you’re dealing with a head cold, a stomach bug, or something chronic, taking care of yourself by sleeping, drinking lots of water, and generally resting up is always a good idea. But what you might not know is that a huge part of your immune system resides in your gut, and relieving stress there should also be part of your healing protocol. Choosing the right foods to eat is especially important when dealing with chronic digestive issues, such as irritable bowel syndrome (IBS), GERD (Gastroesophageal reflux disease), Crohn’s disease, celiac disease, or even something temporary like morning sickness or acid reflux. While certain foods might be nutritious to a healthy individual, they might not be what your body needs when you’re not feeling your best. In many of the cases we’ve mentioned, easy-to-digest foods are the way to go, at least for the short term. They’ll give your GI tract a break while helping feed the good bacteria in your gut that will help you fight off infection and restore digestive balance. We’ll cover foods to avoid, foods that soothe an inflamed gut, and share examples of strategies that will help get you back on your feet. If you’re having digestive issues or feeling sick in general, taking care of your health starts in the kitchen. A healthy diet is your first line of defense. It can get tricky though, as some foods that might ordinarily be part of a healthy diet can pose a challenge to a compromised system. Fried foods and spicy foods can create upper digestive issues such as acid reflux, heartburn, or nausea and will likely exacerbate your problem. Sweets and artificial sweeteners will disrupt the good bacteria in your gut, which supply a big part of your immune support, and feed the more harmful ones. Sugar can also be pro-inflammatory, which can worsen a bacterial infection and make you a lot sicker (1). Artificial sweeteners, and even the natural sugar alcohols (like xylitol and erythritol) in high amounts can increase digestive cramping and cause diarrhea (2). Red meats and raw veggies require a lot of stomach acid to break down and will sit in the digestive tract for longer than cooked veggies and simpler proteins. Raw veggies are also a good source of insoluble fiber, which is great when you’re healthy, but can cause cramping and overactive bowels when you’re not. Avoid salads when you’re sick, and stick to cooked or fermented vegetables. We’ll talk more about fermented foods in a bit. Whole grains can also pose a challenge to a compromised digestive system for a similar reason. Grains naturally have a protective barrier around them that make them more challenging to digest and increases the indigestible fiber content (as compared to white or processed grains). Fiber is an important part of a healthy diet, but when you’re sick or having digestive problems, it’s possible to have too much of a good thing. It used to be recommended for children and adults suffering from gastrointestinal upset, with the idea that these foods would give your digestive system a little break. While these foods do slow down digestion a bit to give the body a chance to recover, they don’t really have a ton of nutrients to help boost your immune system to get you back on your feet. For this reason, doctors have shifted their recommendations from BRAT to a whole foods-based diet of easy-to-digest foods (fruits, cooked veggies, lean meats, complex carbs, and yogurt if dairy is well tolerated) (3). Digestion problems — especially diarrhea and IBS — often include abdominal pain and cramping, so choosing foods that calm and soothe is critical. A banana and berry smoothie with a bit of mint or ginger might be helpful, or a warm soup with carrots, celery, and wilted baby spinach. Bone broth is a great place to start if you’re having trouble keeping your food down. 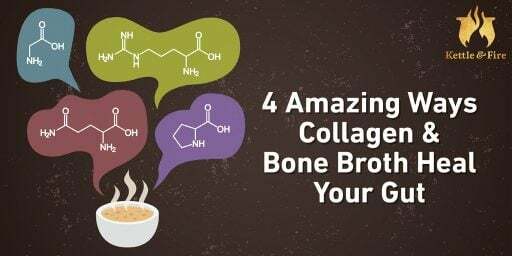 Packed with electrolytes, amino acids, and gut-protecting collagen, bone broth is an excellent option. It also makes for a great base for soups and could even be scooped into a smoothie. 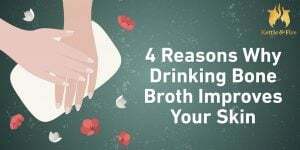 In addition to providing easy-to-digest nutrition, bone broth helps introduce other foods that can help bulk up the stool without creating additional problems. Foods high in soluble fiber, such as sweet potatoes, carrots, oats, and barley can be cooked in broth to help ease you back into eating solids (4). Avoid the barley if you have celiac disease or gluten sensitivity. Fermented foods (and beverages) in small quantities are a great way to build up good gut bacteria, improve digestion, and strengthen your immune system. In addition to generating the good bacteria, the process of fermentation actually makes the insoluble fiber in raw vegetables a bit easier to digest. The bacteria grown during fermentation break down the fibers the same way they do in the large intestine, making the nutrients within more bioavailable to you. We recommend skipping milk kefir and dairy-based yogurts if you have IBS, are lactose intolerant, or suffer from other forms of chronic digestive diseases. While fermenting dairy can make it easier to digest for some, lactose intolerance can often be prohibitive, even with this extra step. Whether you’re dealing with an acute or a chronic health problem, it’s important that you get the medical advice that’s right for you. The recommendations we’ve offered are a good place to start, but don’t replace the tailored treatment options you’d get from your doctor or holistic health practitioner. The foods we’ve listed here are all part of a healthy diet, but it will be up to your and your team of experts to decide when to re-introduce the foods you may be avoiding to give your digestive system a break. Every individual is different, even if the problem you are having is common. How you react to dietary changes is truly individual, so work with your healthcare providers to make sure you’re taking the best steps for your own health. Your body will often tell you when certain foods aren’t right for you. While that can (and likely will) change as we age and as our health status changes over time, be aware and pay attention. Those symptoms we mentioned – acid reflux, gas, cramping, diarrhea – can sometimes be signs of a larger problem. Choose easy-to-digest foods to mitigate your symptoms, reduce inflammation, and refortify your gut biome. We hope that you’ll be back on track soon.